Iranian Vice President Mohammad Reza Rahimi met with his Cuban counterpart Jose Machado Ventura in Havana on Wednesday at the start of a two-day visit aimed at bolstering trade ties, local media reported. Rahimi -- who is accompanied by Iran's industry, energy and economy ministers -- is due to preside over broad economic cooperation talks on Thursday in the Cuban capital. 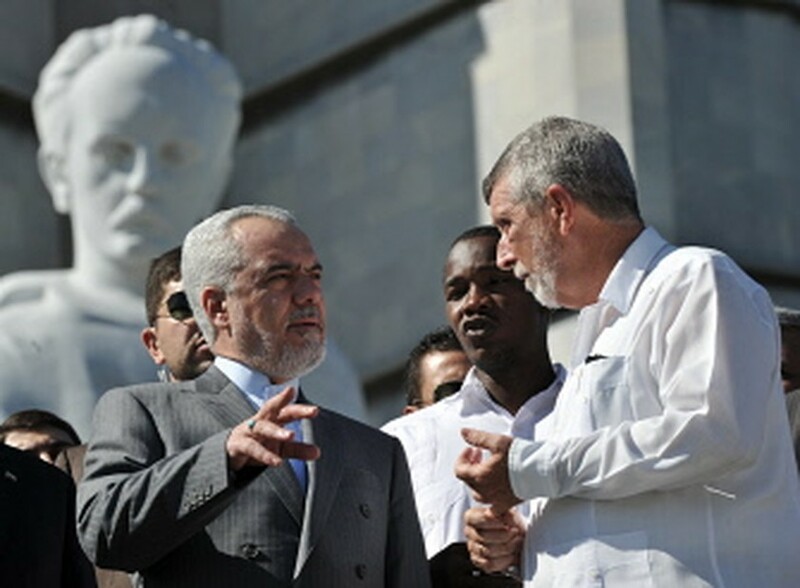 Iran Vice-President Mohammad Reza Rahimi (L) talks with Cuban Vice-Foreign Minister, Marcos Rodriguez (2-L), during the wreath-laying ceremony at the Jose Marti Monument on Revolution Square in Havana, on September 7, 2011. Rahimi arrived in Cuba on an official visit. Rahimi, who will visit Ecuador after his stay in Cuba, laid a floral wreath at the monument of Cuban national hero Jose Marti to start the day, with Cuban Vice Foreign Minister Marcos Rodriguez at his side. Cuba and Iran, which both figure on a US blacklist of alleged state sponsors of terrorism, have grown closer in recent years. Bilateral trade totaled $27 million in 2009, dropping off from $46.6 million the previous year as the global recession hit. In 2009, the two countries formed a joint venture to produce refrigerators and other small appliances for the Cuban market, in addition to parts for the railroad industry. Cuba got a $680 million credit in the deal.